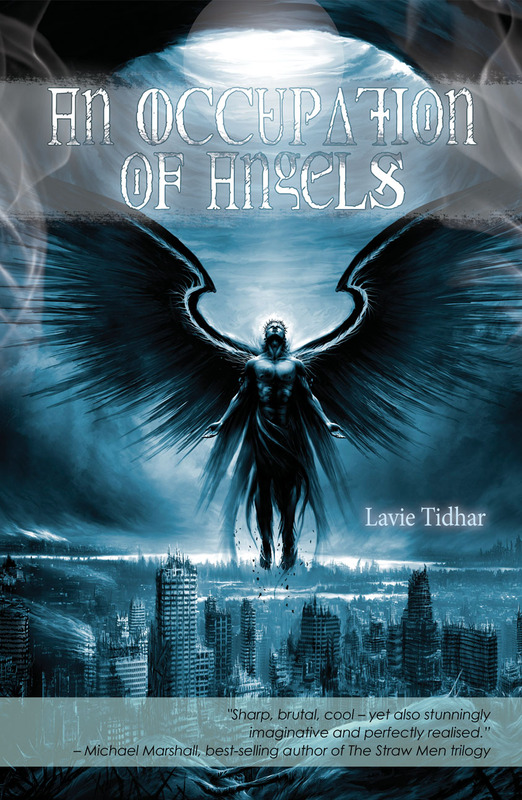 The central conceit of Lavie Tidhar’s An Occupation of Angels is that at the end of the second world war, angels arrived and ensconced themselves in various places (often of religious significance) around the world. Although this is clearly a fantastical premise, the novella itself is clearly a hat-tip to cold war spy fiction. It is still set against a backdrop of east/west antagonism and (with some details changed) deranged Nazis who managed to extricate themselves from Germany at the end of the second world war. As such, it draws from cold war fiction. Be that written or filmed. I enjoyed this aspect of it. The constant and terrifying spectre of horrible flaming nuclear death from the end of the second world war to the fall of the Berlin wall and the collapse of the Soviet Union notwithstanding, the period produced some excellent spy fiction*. For me, and I suspect, many others, a lot of this comes in the form of the Bond films. I should make clear, not the novels. I made the mistake of reading a few of them when I was younger and, well, they’re misogynist, racist nonsense and Ian Fleming was – rather unfortunate if your job is ‘author’ – very bad at writing. The Bond films weren’t, of course, shining beacons of right-on feminism and anti-colonialism. But they had, at least, enough camp to them to make them feel slightly quaint now. Watch the films, ignore the books. One other specific influence on Tidhar I’m aware of (‘cos he said so in an interview and it’s in the dedication) is Adam Hall’s Quiller stories. Unfortunately, I’m not familiar with that series, so I can’t comment. Anyway, the point of all this is that while there is a certain amount of grit to the novella (in the sense that I think that the more recent spy fictions tend to be grittier than 60s and 70s Bond), it manages to evoke a feel for cold war thrillers without the questionable politics that they would often bring. A. Good. Thing. At the start of the novella, a British secret agent, Killarney, is tasked with finding out who it is that has been killing off the angels and what they hope to achieve. The consequences of the deaths of the angels could be terrible indeed. This opens up a breakneck chase across Europe to discover what has been happening. Along the way Killarney finds herself captured and threatened with torture and death more than once with little else in between. This novella is lean. No room for any sub-plots or unnecessary obsessing over the various motivations of the characters. First thing to note in this is that Killarney is a woman. Granted, I haven’t read a lot of contemporary spy fiction in recent years; perhaps it is jam-packed with female spies and strong female characters and I just didn’t know, so I’m happy to be corrected on this point, but it is quite refreshing to read something like this where the female character is central and not there for the pleasure of a more competent male. “‘Which airline do you need?’ he said. ‘North Western,’ I said, which was the agreed code, and he said, ‘Really? I prefer British Airways,’ the whole ridiculous affair remaining ridiculous until the second you forget to use it and it’s the knife in the kidney, the knife you didn’t see inside the wrong newspaper, or the poison-tipped umbrella scratching your leg because you let your guard down for just one second. I tended to feel that the parts of the writing where things went this way that the sentences were perhaps a little clumsy and didn’t quite do the ideas justice (and this is, I think, a chap who has a lot of ideas). Given the speed at which things happen to Killarney, this isn’t quite so catastrophic as one might think. Though I do tend to feel that that fast pacing is more effectively shown through shorter sentences. I enjoyed this, a lot. Though it’s far from perfect, it wins in two important respects. Pace and length. The reader is really left with little opportunity to draw breath. In a story like this, where the protagonist is racing across a continent to save the world, this is to be welcomed. The other thing is that this was republished last year from an original publication in 2005. Having (before this, as it happens) read some of Lavie Tidhar’s other short stories and novellas, I can happily say that it gets a lot better, as (if I were a writer, anyway) one would hope. Excellent fun for anyone who fancies an homage to cold war spy thrillers with a healthy dose of the supernatural without the baggage of that time. I liked it a lot. * I realise that this is an extremely crass reduction of what was a frightening time to the opportunity to write some fun stories. I was 12 when the Soviet Union collapsed and while, perhaps, by that point the cracks were definitely beginning to show, through the 80s, as a child I was genuinely afraid of nuclear war. It’s easy now to say that the Soviet Union was bound to fail, but that’s a glib way of looking at something with the benefit of knowing that, well, it did. This entry was posted in Review and tagged lavie tidhar, novella. Bookmark the permalink. Glad you enjoyed Lavie’s book!